Life has been crazy with a new town, new job, and lots of new responsibilities. But, I am finally here with a new video. As promised, I am going to share with you how I make quick, easy, and inexpensive vegetable noodles. In the video I show how to use the "Veggetti" vegetable spiralizer to make noodles from zucchini and sweet potato. 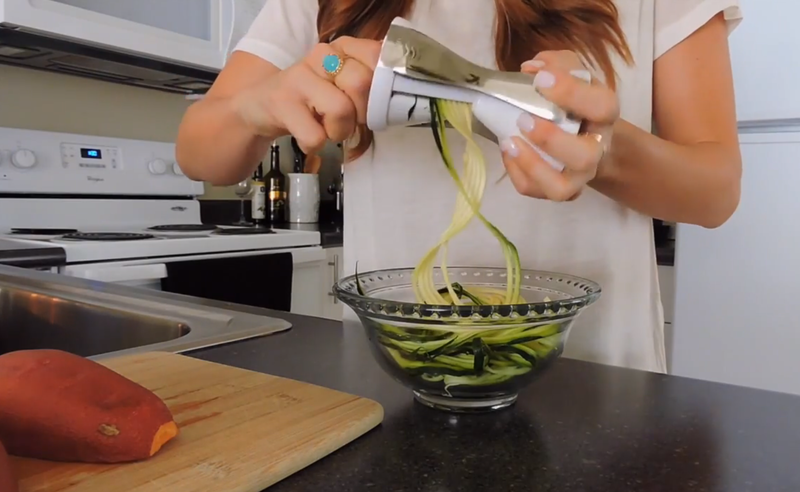 The Veggetti can be found on Amazon here: Veggetti Spiralizer. I have also seen them at Bed, Bath, & Beyond~ so check your local stores! While zucchini and yellow squash are my favorite veggies to spiralize, there are tons of other options too! Try carrots or cucumber as a raw noodle on salads or as a cold "pasta". The options are endless, and you will be amazed at how veggie noodles can bulk up your meals! Follow the link below to see the video! This is very useful tips. Thanks you so much for sharing. Its success has been seen in cancer, AIDS, Crohn's, ulcerative colitis, Lyme disease, Multiple Sclerosis, chronic fatigue/fibromyalgia and any conditions related to allergies and export iphone contacts. LDN has also been used with good results as an Autism treatment for individuals on the autism spectrum, PPP and ethernet both look for the next frame start signal.